When I first started working from home, life went into chaos. As a teacher, I had lesson plans, unit calendars, to-do lists, file systems, and a very structured bell system that told me what I should be doing all day long. It was perfect for my Type-A personality because everything has its proper place. Then, I was suddenly working at home and starting from scratch. CHAOS! 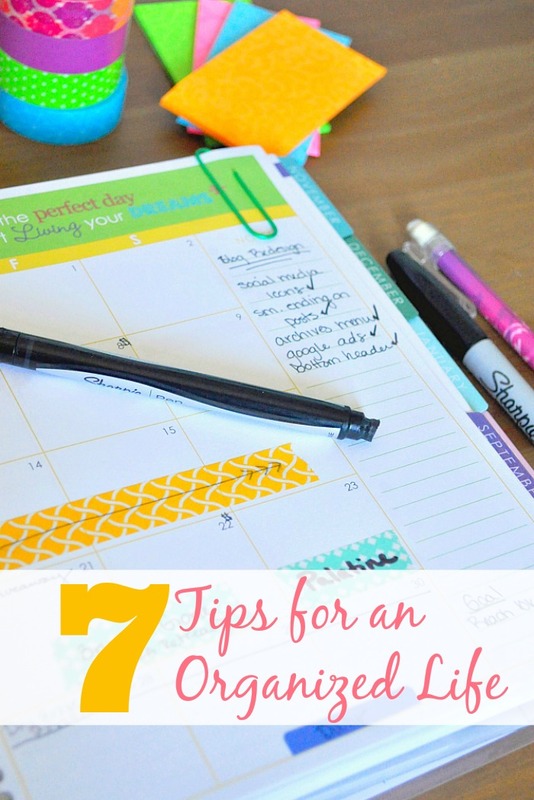 However, I finally have my organized groove back, so I’m sharing my 7 Tips for an Organized Life! This is not to give you the wrong impression. I am not 100% organized all the time. My office is really tiny and usually becomes the dumping room. I just spent yesterday afternoon putting the office back in order after the holiday craziness: wrapping paper, boxes and decor supplies everywhere. I have worked hard at planning and organizing my life though and want to share with you tips that have worked for me and for our marriage. 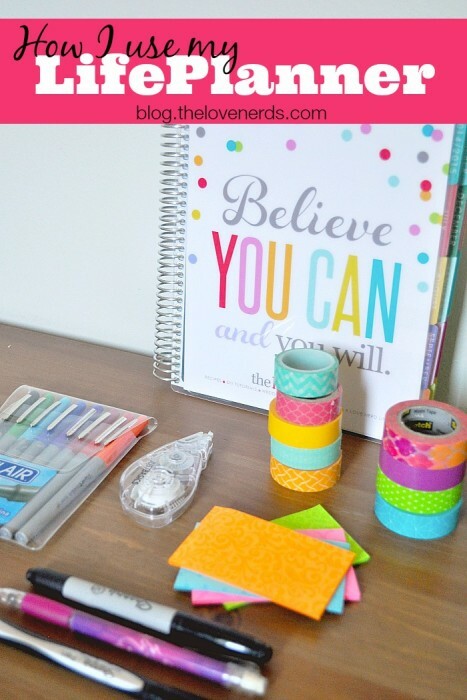 Plus, the whole post ends with an AWESOME Erin Condren Life Planner giveaway that you don’t want to miss. I came to a realization that most of the disagreements Bryan and I had were over our schedules. He would forget to tell me about a late meeting which would inevitably be the night I planned a nice dinner or I told him in passing I was going out to my parents’ house when he was busy and distracted. We needed a new system. So now, every Sunday, we sit down and have a family meeting. During this time, we discuss the week ahead and make sure our calendars are updated. It is also the time we review any needed budget info or long term goals/projects, like our vacation in March. If you meal plan, which I recommend down below, this is also a great time to discuss meals for the week, and I always ask my husband for a couple meal ideas. These do not have to be long, formal meetings. Last night, our family meeting lasted 5 minutes between episodes of Friends. What is really important is that both of you are looking at your calendars and talking through the week. Our normal Sunday family meeting is with brunch. Since I normally make us something a bit more special for Sunday breakfast, we sit down at the table together and bring along our calendars. Whatever works for you, this time is invaluable. We are more in sync and those little schedule fights are less common. It’s a total win! Find a quiet time to sit down with your calendar and schedule out your week near the beginning. 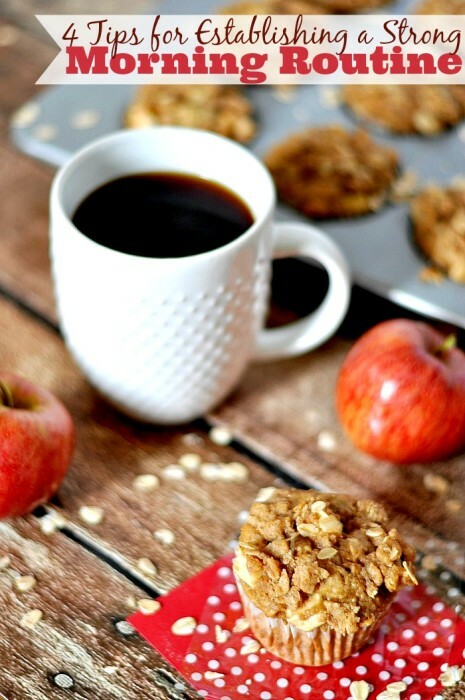 For me, this works best on a Sunday afternoon with a pop and snack or Monday mornings over a cup of coffee. Because of our family meeting on Sunday, I already have our personal/night events entered into my planner in addition to any events on Bryan’s schedule that might influence me. So my first step during this time is to transfer my routine projects and activities over to the new week. Then, I start adding any new meetings or assignments into their proper slot. If in doubt, write it down! If you are anything like me, it will never enter my mind again (at least not on time) unless there’s a written reminder. 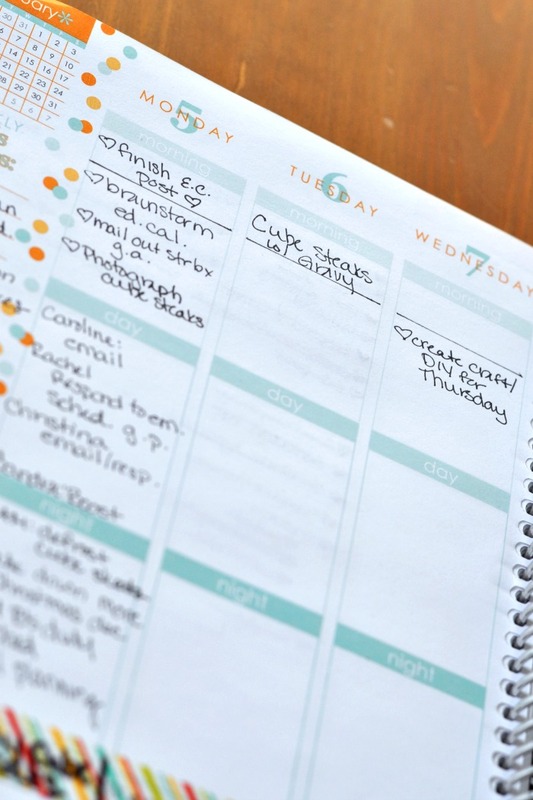 While planning my week, I also take time to meal plan, create our shopping list, and schedule a shopping trip. Now, I do not get super fancy about my meal plan or even plan out the whole month. I do, however, create a list of meal ideas that would work for us in the next week or two. I find that having a rough schedule for our meals takes the stress off me at 5 o’clock when Bryan asks what we are having for dinner. Tip 4: Take time for you. I know this is a cliche statement but you need to take time for yourself. AND, if you are anything like me, you need to schedule it to make sure it actually happens. As busy as life gets, I find that I operate better when I take time to recharge my battery. 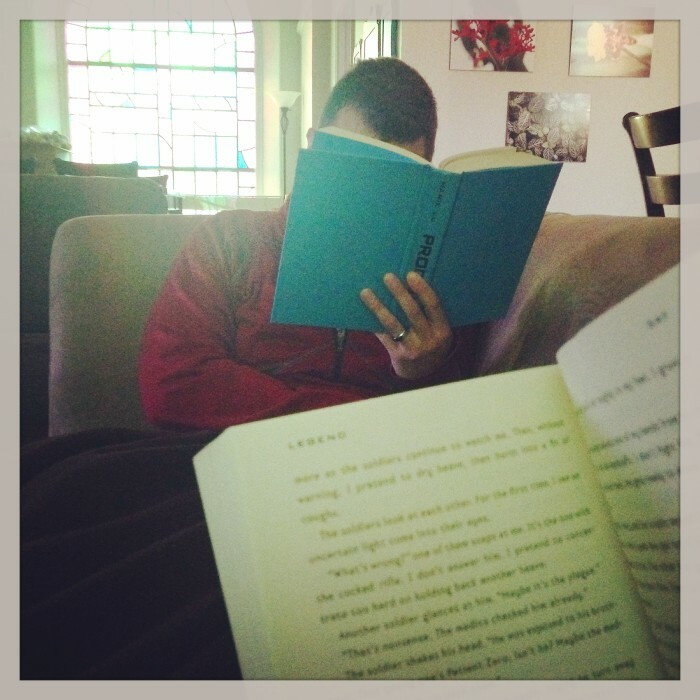 On my schedule, this looks like reading a book, spending time with my family, applying a new Jamberry manicure, a morning to sleep in, or special time with Bryan. Whatever makes you happy, put it in the schedule. You really will be healthier and happier! I don’t really believe in New Year’s Resolutions, but I do believe in setting goals. I am constantly setting yearly goals, monthly goals, weekly goals and daily goals. Most importantly, I WRITE THEM DOWN! Goals are not something to be thought of in passing. You need to see them, check in on them, mark down progress, etc. It is so easy to let the daily to-do lists rule your life, but setting up good habits will allow you to keep your eye on the big picture as well. In my planner, I have a note page in the back for my yearly goals. Remember that the yearly goal needs to be broken down into smaller pieces – how are you going to accomplish it? What steps do you need to take to make sure it happens. Many of these small steps become my monthly goals, which I write down on the side of my monthly calendar spread. Without my to-do lists, I would be lost. My brain was simply not built for keeping track of loose information, important tasks, birthdays and deadlines all at once. Hence, to-do lists. However, having a to-do list a mile long with everything possible thing that needs to get done in the next month or even just week is impractical. You become unfocused and preoccupied with items that are not time sensitive. By creating manageable to-do lists, items that I can reasonably complete in one day, I am more focused and feel way more accomplished. It feels a lot better to see my list crossed off than 40 more items on the list that need to be done. One thing that has helped me with this is keeping my to-do list in my planner and adding items to their real day. My weekly spread is mostly reserved for my to-do lists. Instead of morning, day and night, I use the different sections for Blog, Client Work, and Personal. As a rule, I try not to have more than 5 things in each of these boxes. While not always possible, it is usually doable because I evaluate those items pretty closely. Instead of putting everything that needs to be done that WEEK in a day list, I put things in their rightful place. For example, I need to have a craft photographed on Wednesday. Instead of listing it under today, I add it directly to my Wednesday spot. If something needs to be done this week, I add it the weekly goals/to-do list on the left hand side. It doesn’t mean you can’t work ahead, but it will keep you focused on the items that really matter for your day. This is has truly been the game changer for me these past 5 months. I tried lots of different digital suggestions that people made, but nothing really worked for me. Then, I decided to go back to pen and paper because writing things down helps me remember them and I don’t always want to be tied to my phone or computer. I again did a lot of research and decided on the Erin Condren Life Planner. I have posted about my planner a couple times already, so you can head over to see why I chose this planner and how I am using the planner instead of me posting it again here. If you are interested in buying your own, use this referral link and sign up for their newsletter to get $10 off code for your first order. Whichever planner you choose, make sure it is something that can work for you and keep an open mind. 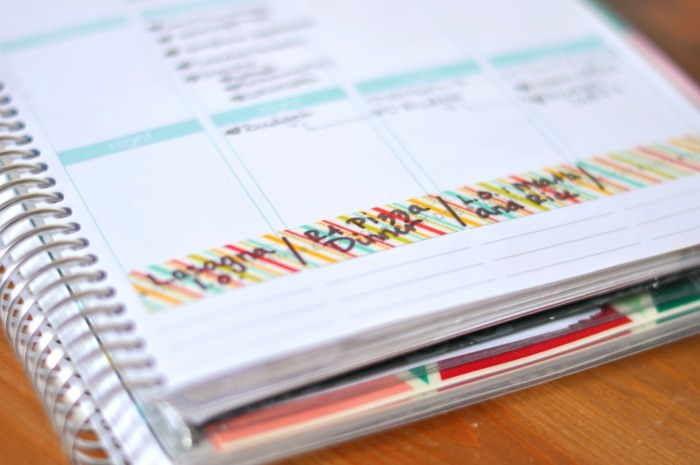 Many people say no to Erin Condren because of the Morning, Day, and Night layout. Me? 3 sections was perfect so I just changed it to work for me. Getting organized is a big challenge for me. I’ve always been a wing it kind of girl. Time to get a planner and actually use it. I especially like your tips on meal planning – I totally relate! Great post and super helpful! Planning to print this one out and keep it for reference. Any advice or tips on figuring out what to-do’s are needed when starting a new and unfamiliar project? I’m still in the process of mastering my time management skills. There seem to be so many taskers put on my list daily and it could become quite annoying. So what usually helps me is using a journal where I list all my assign tasks on and cross them out whenever I complete something. At first it was strange to always write down my goals, but the longer I keep at it, the easier and more efficient I become. I try to have a menu plan and write things down! I would LOVE ONE OF THESE PLANNERS!!! I tapped a calendar on the inside of my cabinet. This way I can see the month. I clean the kitchen up after every use. This keeps clutter away, my mind at ease and I feel more inclined to dive in at the next meal. I have a chalkboard in our kitchen divided into sections for grocery, target, and a section for meal ideas or requests. So easy to write something down when you are low or runout. And meal planning is easier, I love it when family writes down something they’ve been craving. I am so glad I just found your site! I actually found it on pinterest with a recipe but now am following you! Thank you so much! Lists and Labels are the best way for me to stay organized! I would love to win a planner. Thanks! I use list and try to follow a routine to stay organized. i write everything on a dry erase board calendar that’s on my fridge. I am a list maker! Without a list nothing gets done here!! I write a lot of lists to keep on track! I always try to write things down as soon as possible. Loved your tips and EC products are awesome! Thanks for this post. I wanted an EC planner but wasn’t sure how to make it work for me. (I’m not into stickers etc.) You had some great ideas here. I have been seriously going back and forth on whether or not I want to use a life planner again! This post makes things so clear! Great job! I’m a notorious list maker. But I also like to let everything have its place, that’s about my only organizational skill. I really need this. There are so many things that would really help me. To-do lists are my life saver as well, but as a teacher, I must prioritize my to-do lists in order to get the most time sensitive things done first. I’ll write down everything I need to do, then put it in order starting with the most important. This is the biggest way I stay organized! I also write everything down on a weekly and monthly calendar. Cheers! Thus is such a great post!! I like to make lusts. They help me tremendously!! I forget or lose them at times, and it throws me off. Great tips! I’m considering swapping my digital way of planning (using gmail calendar) for a pen-and-paper organizer, and this one seems adorable and useful. I write things down on a To-do list -especially for work! Love these suggestions! Thanks for sharing! I carry around a notebook with a calendar and write everything down! Otherwise I am a hot mess! I make lists to stay organized. I make lists to try and stay organized. I am a teacher, and I color code my files for the grade levels that I teach and units so that I can quickly find the file I need. We use a big family calendar so we know where everyone is or has to be. I write everything down on a list. I try to file away important papers. I am not great at it though! I print out monthly calendars and put them in a tabbed pocket folder to plan out our meals weekly. It helps me make sure we are including some variety, and cuts back on eating out. I stay organize by planning my week out beforehand. to stay organized I put everything in my iPhone calendar and set alerts. Then I review the next day evey night before I go to bed! I love to make lists! LOOOOVE this planner! Totally wanna buy one is I don’t win! I love Erin Condren planners. I really am going to try to keep one up for my blog and my home life separate. I make lists every day! TY for the giveaway! I would love a life planner. I am starting up my blog and think it would help me so much. Thank you for doing this great giveaway. To stay organised I label everything! I definitely need to get more organized. The one area I am pretty good at is meal planning…. I plan out meals 2 weeks at a time and post all the options on the fridge then every day around lunch time I call the hubby and give him 2 or 3 options from the list. This way I have plenty time to prepare and most of the time I can have it ready by the time he gets home. Thanks for this AMAZING giveaway! Keeping my fingers crossed. I write things down in a notebook instead of sticky notes because the sticky notes go all over the place. This way all is written down in my notebook, all contained. I use the calendar app on my ipad and sticky notes. I really need a Life Planner! I have a designated place for everything too. I find this helps to keep clutter down. I’m a to-do list person. I keep a planner, lists, meal planning lists (that we may or may not stick to…), and it helps to write everything down. I write lists and group like things together in containers! I love to organize and make things very efficient. I am extremely disorganized by nature but attempt to keep my appointments in order with a dry erase board and also post it notes. A planner or journal would help me incredibly. LOVE LOVE LOVE the Erin Condren life planner! I am a total pretty paper/panner/notebook nerd! I love keeping memories so they are never lost in life! I have been looking for a new planner for this year. Would love to win this! One thing I do to stay organized in my classroom is that I have several plastic containers with drawers that are labeled with items that we use in class (pencils, erasers, glue, crayons, etc.). I make lists. But I need a more complete system to keep track of my various schedules! I use a menu board to help keep my family meals organized! making lists of things to do! Delete this one…I didn’t see if it my comment showed up so I sent another one. I make lists all over the place! It would be great to have one special place to keep all of my lists together! I have a calendar on my wall in the kitchen and I also carry one in my purse. i try to be consistent. I start with one little thing. Like, ALWAYS putting the folded laundry away as soon as it comes out of the dryer. Once i master that (yes, its a tough skill for me, haha) i move onto another thing to focus on. one day ill have it all in order 🙂 thanks. I try to write down all the important things I need to remember to do! I might be more organized if I had one of these fancy planners. Right now I’m a hot mess! I use LOTS of bins and furniture to organize. Meal planning! It keeps my fridge, cabinet, and budget in line! I love this post! I’m really wanting it get organized and I’m drooling over this planner in the pictures you posted. Thanks for the great and inspiring post! my goal is to be more prepared weekly. I’ve been eyeing an Erin Condren Life Planner, but there is no room in the budget for it. *sad sigh* I’d be so happy if I won one!! I used to write everything down until my EC planner ran out!! I LOVE planners and need a new one for this year. This would be SO cool to have! I stay organized by using my calendar on my i phone to enter dates. I’m not super organized right now! That’s why I’m looking forward to hopefully getting this planner to help me get things in order! I have 5 children and a husband in the military, so you would think I should be organized! I was semi organized before my last baby was born on July 4th this past year. I just haven’t gotten back into a routine yet. I’m slowly, but surely working on it though! Progress counts, right?! Oh man! I have heard SO much about these planners! I am just drooling over them! I resolve to be more productive in my creative life! I try to use a Calendar for keeping events and appts. straight, but I haven’t been very consistent at planning/calendaring! We have a mail sorting station right by the front door so we can do that quickly so it doesn’t pile up. Wow! This is totally awesome! I love Erin’s planner and it’s very generous of you to be giving some away. I am so bad at this. It is one of the largest goals of this year. I need all the help I can get. I am writing on post it. This planner would be better idea! I am a planner and a list maker. I use many pieces of paper and notes in my cell phone, but it helps me stay somewhat organized and get things done. It would be nice to have one central location for it all though! I love planning everything out. I have a calendar whiteboard in my bedroom to keep track of bills and events, and whiteboard in my kitchen to display the menu for the week, and a planner for work. I write absolutely everything down. If I don’t, it will most likely be forgotten. I have too much going on to keep everything in my head. When I start getting overwhelmed, I sit down and do a brain dump and get all that stuff out of my head and onto paper where I can deal with it. I love to do list and planners. I feel like my desk gets taken over with the post it notes on my desk. Would love a planner! I love using planners to stay on task and keep organized!!! One thing I do to help me stay organized is make lists. I am a list maker through and through! Since I have a horrible memory, especially now while I’m pregnant, I am constantly making lists. I make lists for everything….chores I need to do, groceries, gifts I need, etc. Winning this would be a great help in keeping me organized! I have to write things down and mark them off in order to stay organized. I have gotten out of the habit and need to get it back. One of the things I’m trying is to schedule time with friends and making maintaining those relationships a priority. I have used a planner for 20 years, and I can’t imagine trying to function without one! I would like to give this one a whirl. Planners are the only way I can keep track of all the goings ons! I use a planner of sorts to keep work, doctor appointments, school happenings and assignment due dates written down. But I am HORRIBLE at meal planning. A friend shared her Erin Conde in planner with me yesterday and I am intrigued. I have a full time career, trying to advance so I am a full time college student and am also trying to eat healthy and begin a workout routine. This is all great but I am so disorganized – I am also financially bound but maybe sims of the tips here will help get me organized without having to use an expensive planet. Here is hoping for the best! My husband and I also have a weekly meeting that has proven very helpful. A paper planner also works much better for me than electronic calendars. I’m still trying to figure out a more productive way of creating and utilizing a to do list, though, and your suggestions for that are helpful! I have been trying to get more organized by writing everything down. I tried to use a digital planner and I realized I need to physically write things down. But until I get a 2015 planner, we have a cork board in our mud room. I stay organized by pinning important things on this board to remind me and my family of important things co,in up! I have a notebook that I attempt to keep up to date. I would love to have a calendar/organizer again. It worked great for me a couple years ago but I’ve gotten out of the habit. I’ve been in the process of starting a home based business as well as working full time. I’ve had a planner/calendar for about a year now and I’m wanting to take it to the next level. I love how you have broken down everything that I’ve been thinking and wanting to do. Hopefully I can finally put some of these things into practice. Thanks for the great post! I went back to pen and paper too! Like you I remember what I w-r-i-t-e down. Heres to a more organized year! Cheers 2015! We have a dry erase calendar stuck to the back of our front door. Then, we have a clothes pin that we use to put things to take with us, like lunch money for the kiddo. We also have a regular dry erase board next to the calendar. During the busy months when I was working super long hours, they weren’t updated as well, but I am trying to get back in the habit! I print out my Outlook calendar for the day so that I can get an idea of what my day will look like (meetings, deadlines, etc). I then add any tasks to the same sheet and use that to plan out my day. My husband and I have began meal planning for the week so that it is not a rush to get dinner during the week. I also make a weekly to-do list, but take a minute to adjust the day of to make changes for things I didn’t get done or if I have worked ahead. I also find I need to write everything down in order to stay organized. 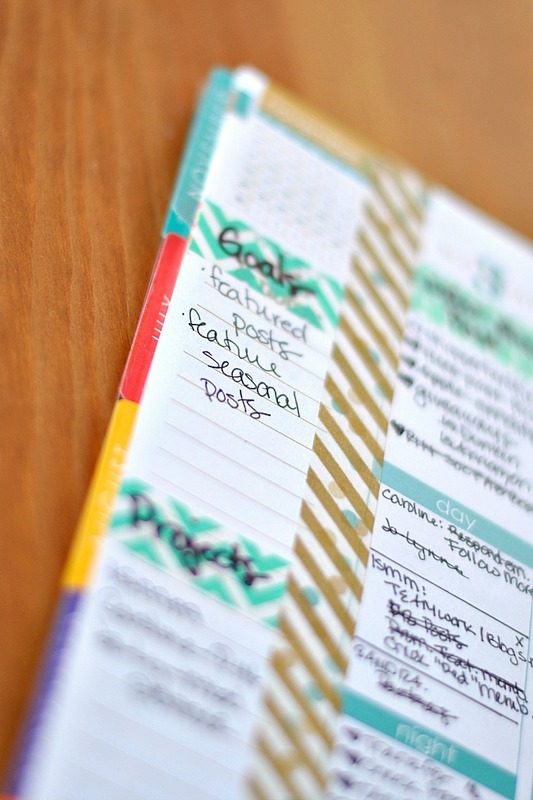 I love this post- I just bought the planner and am excited to get it and start using it. Hopefully it helps my chaotic life! I have been looking for suggestions on how to best utilize it and I love your comment about re-using the weekly breakdown! Thanks, I will start following your blog for sure! I would love to have one of these planners. Someone introduced them to me the other day- and said they are wonderful. At this point they are not in my budget, so it would bless me to win one. Thanks again for heart to bless others. A big month by month calendar on the fridge, as well as a good ol’ paper planner! I too need to write things in pen to remember them! I’m interested in trying some different planners and this looks amazing. I find I don’t remember things well if I don’t jot them down, but I need a central system so I don’t have to go 3 different places for information. Health problems interfere with my memory these days but I still need to manage my household, finances, daily life. I have a very large whiteboard in my kitchen where I plan out all of our meals for the month! I keep a weekly dry erase board on the fridge for all of the kids school info….I jot down quick notes on what homework is due on what day, if there is a field trip, etc. I have a big family calendar on our fridge and we write all of our events and plans on it. It helps us all know what’s happening! These tips are great and much needed, as my goal for 2015 is to be more organized and “streamlined”, for lack of a better word. I’m also switching to a paper planner because I hate looking at my phone calendar and seeing a little dot on a ate, but having to click on it and open it to see what the event/appointment is; it drives me nuts!!! I have just started to plan further using daily to-do lists and a more organized planner system. So winning this would be an awesome motivator. I’m trying several new things at once, but one thing I’m realizing works best is holding myself accountable to someone else. Publicly, or outside of my home. I’ve found a group on facebook that plays “games” like “To Do, Ta Da” throughout the day that help me make a public list of what I need to do, then an additional list(s) when I compete those tasks. It’s fun, easy, and motivating! I have multiple calendars, a wall calendar for all appointments that the family can see, a paper planner that I put all the kids appointments in and my phone calendar that gives me reminders. I email myself reminders and set alarms on my phone. I had to go back to a paper and pen planner after a head injury. Erin Condren’s planners seem to be the only ones that can handle being taken in and out of my bag 40-50 times a day due to memory problems and having to write everything down. I work at keeping the day organized and hopefully the weeks will fall into place. I lesson plan online using Planbook.com! It is totally worth the yearly subscription fee to be able to access my lesson plans from iPad, home computer, or work computer! Plus, I can share my lesson plans with anyone! I make daily lists and take time on Sunday to organize my week. To stay organized I try to do something in every room every single day – whether I want to or not. I use sticky notes like no one’s business! I have to make a list everyday of at least 3 items that I need to accomplish that day. But I really need to find a better system with a new baby on the way! I keep a small notebook in my purse to write stuff down so I don’t forget! I stay organized by keeping lists on my phone. That way I always have them and don’t forget anything. I make lists to help me stay organized! I can’t imagine where I would be if I didn’t have a list! I use a menu planner, when I remember, but other than that I REALLY need help being organized! 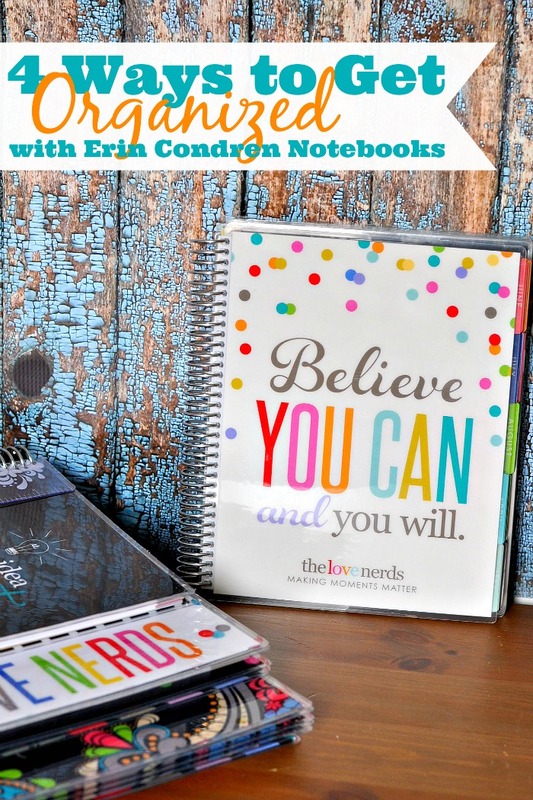 I’ve had my eye on these Erin Condren planners for a while now. Thanks, Maggie! I write everything down in my calendar! My goal is to get myself more organized this year!! I want to follow a planner more- for sure! I’m a big fan of color coordinating to stay organized. I find that if everything has a color, I manage all of my activities and to-do’s better. Love your organizer! I leave myself reminder notes. They help most of the time. My system definitely needs work. Thanks for the helpful tips. I know a meal plan would be amazing. I’ve yet to make one work. SO glad I found your blog. I haven’t even bought my planner for the year. I am a stay at home mom, but with 3 kids; our schedule can get crazy. Thanks for the tips! I do the same thing with my calendar every week! I also do an overall scheduled at the beginning of the month so I can see what’s coming up. I color code things so I know what is blog, church, family and homeschool stuff! Great post. I’m really hoping to win-I’d love to try the EC planners! Loved the post! I’m always struggling to take some time for myself…need to get that into my daily schedule. Crossing my fingers on the ECLP giveaway!! I’m creating an organization board on a foam core presentation board that I painted…it’s where I’m putting my editorial calendar. Honestly, I don’t really do anything major to keep myself organized…I’m terrible lol! This planner would sure help!